I read about Enchanted Vision project on both Amy Brown and Jessica Galbreth’s websites. I thought it was a project between them both at first before I saw other artists posting works created for this project on DeviantArt and Facebook. I found this project amazing and challenging. I love the opportunity given to artists from around the world to gather on a common project and work on a given theme. I have included the 3 following pieces : “Enchanted keys” (created for the theme “the Key”) , “The Last Candle” and “Wish I had wings” (created for the Frustration theme). “Enchanted keys” : I love keys !! 🙂 I’m always wondering which secret doors or chest they might open and what treasures and wonders we might discover. 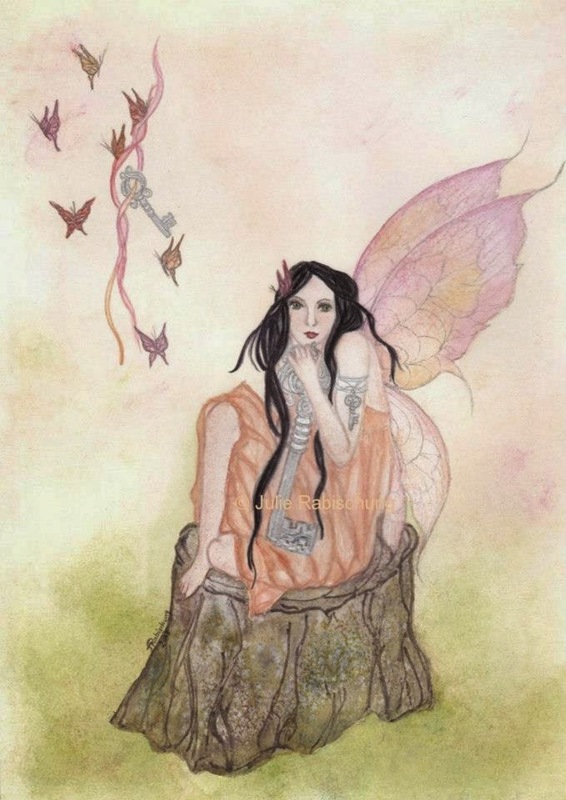 In this painting I wished to represent a fairy holding a big key as if being the guardian to the secret door of the Realm of Faërie. But is it really this big key that opens the secret door to Faërie ? It’s one of my earlier paintings but still one of my favorite. 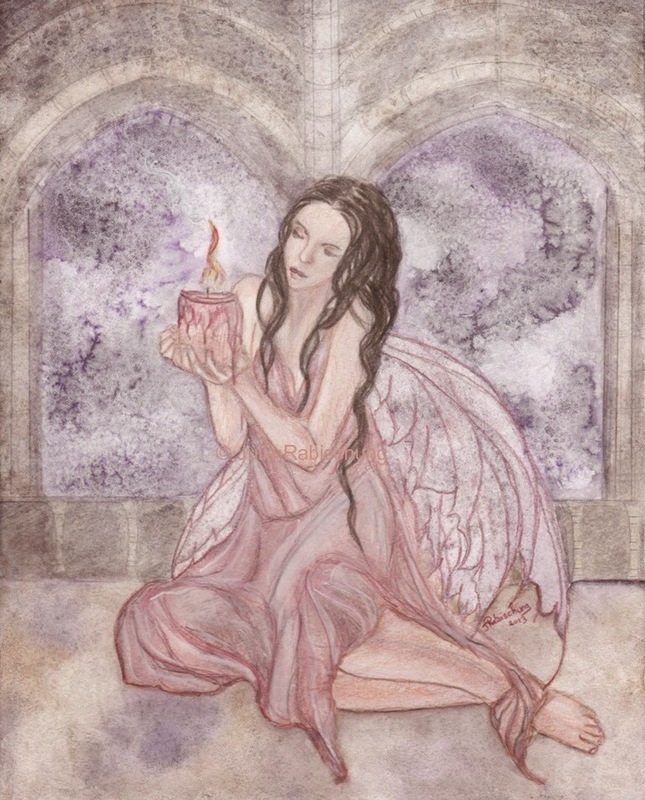 “The last candle”: I wished to create a more emotional piece for this theme, not too dark but with a fairy silently sitting alone as if waiting for someone to return and holding the last burning candle for him/her. It was one of the first painting where I painted architecture in the background. Lots of work still but I love gothic architecture and I’m really trying to add more of it in my backgrounds. 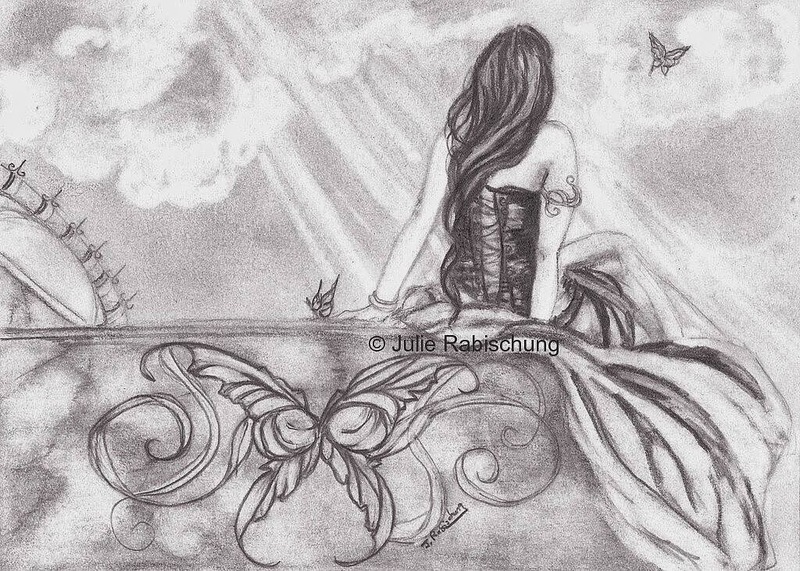 “Wish I had wings” (frustration): One of my latest pieces for Enchanted Vision and one of my very first graphite drawing. The idea to create a black and white piece came for the frustration with contrasts I’m experiencing every time when painting. I’m always struggling with shadows and lights and I wished to work on the source of this frustration here by working only in black and white and try to improve in creating contrasts and values. Here my character also is frustrated seeing the butterfly flying away as she too wishes she had wings to fly away. Yes I do. I’m generally offering the original for auction as well as prints. I love to work on a given theme, it gives the opportunity to work on themes we might not have thought to explore. I don’t see it as a challenge at all as I love the concept of artists working on a same theme and I’m always looking forward to see all the pieces that will be created. I like to see it more as a “collaboration”, a worldwide project we are all working in together. And I’m always amazed by all the different works we can create on a same theme, we may work on a same theme but we all have different ideas and styles and that’s the strength and beauty of this project. Art is a passion. I love to draw and paint, to experiment with various mediums to find my own mixes and effects, to play around with color schemes.. I started to follow my dreams and begin my artistic journey a couple of years ago and I’ve already met so may wonderful people and fellow artists !! I’m self taught and it is not my profession. But as I’m working part time I have time to work on my paintings and try to improve and find my style in the hope that maybe in the future I could make it my profession. We’ll see where this journey will lead me but even if I could never work in the art field professionally I know that I will and could never stop to create. I don’t have a dedicated room for painting as I live in a small appartement so my workspace is currently my desk at home with watercolor paper, paints, brushes, pencils stored on shelves and stored in boxes. I’m usually storing my sketches, works in progress away from light in a folder and the finished pieces in a portfolio. However I’m always keeping a small drawing pad and a pencil in my bag to be ready if inspiration strikes when on the train or when walking ! Alongside my desk where I paint I’ve set a place where I’ve installed my computer, printer and my new wacom tablet. My dream work space would maybe be able to have a room dedicated to art/painting where I could have all my painting tools together and also store prints and products created. Thank you so much Julie for this wonderful look into your creative process, your art and you. Please visit ENCHANTED VISIONS to see more of Julie’s art and what she has created for the latest theme. Posted in artist feature, artist interview, Enchanted Visions, Friday Art Feature and tagged Julie Rabischung, painting. It is nice to get to know you, Julie. 🙂 Tori, you do such a good job with these interviews! I am an artist on the move, too! I have a clipboard that holds paper and pencil so I can carry it with me everywhere. Nice to get to know you better here, Julie. I studied French for many years. I don't use it much these days. I love your artwork and really enjoyed reading the ideas behind each piece. I used to try to balance out holding a "regular" job and do my art when I had time. I wasn't able to do as well at that as you do!